You may clear customs at International Falls/Fort Frances. Follow Highway 11 East from Fort Frances to Highway 502. Enjoy a scenic drive North on Highway 502 to Dryden, Ontario and the Trans Canada Highway. From Dryden it is a 25 minute drive West to Vermilion Bay. 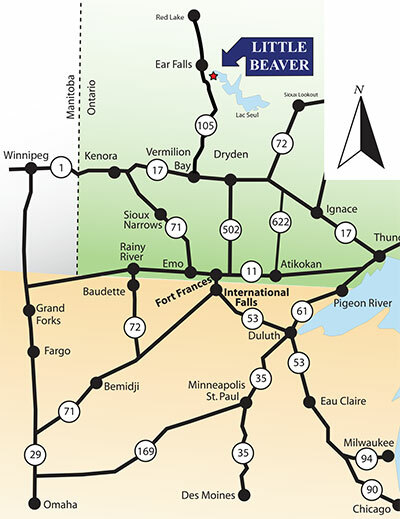 Turn North on Highway 105 and travel 60 miles to our driveway. We are located 5 miles South of Ear Falls, Ontario.